Dane G. Hansen Foundation | That’s a lot of shingles! You are here: Home » NEWS » GRANT STORIES » That’s a lot of shingles! A grant to the Thomas County Historical Society supplemented insurance claims after hail damaged the Prairie Museum’s historic buildings. The Cooper Barn was by far the largest project of all. 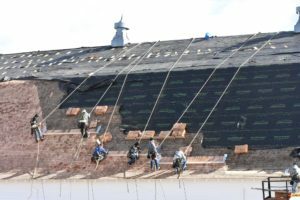 There was a great deal of interest on social media about the photos detailing the process of stripping the giant barn of its old shingles and installing the new ones. Evidently the question of just how many shingles it took to cover the Cooper Barn roof was coffee shop talk in a number of communities. The answer? The roof required approximately 105 squares of shingles, each square covering 100 square feet. The Barn retains a great deal of affection in northwest Kansas among those who attended livestock schools or whose parents and grandparents worked for Foster Farms. In addition to other school groups, about 300 area grade school students come each spring for Prairie Fair. The new roof ensures that the barn will continue to be a vital piece of the agricultural past serving a key role in the education of current and future generations of northwest For Kansans. The new roof also insures that exhibits and artifacts telling the story of high plains agriculture are protected from the weather and can continue to inform visitors from near and far.